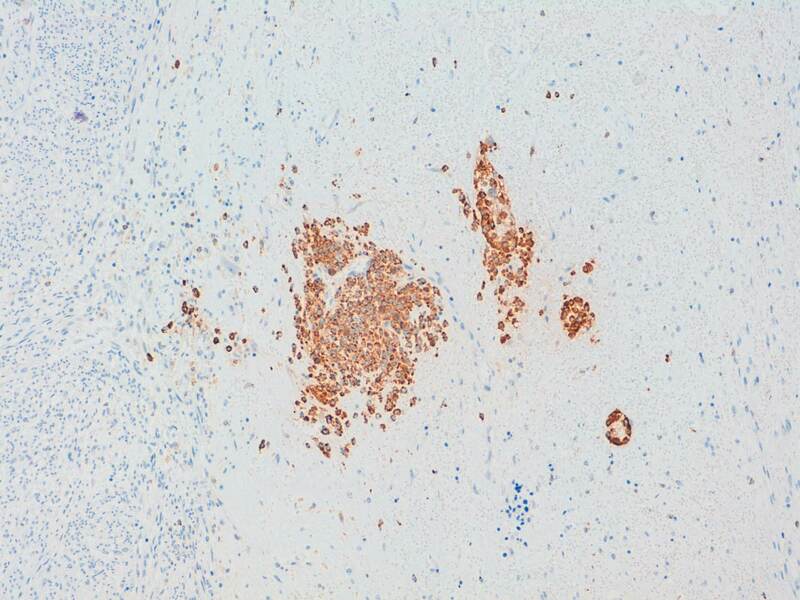 Thanks to Dr. Carolina Martinez Ciarpaglini, Department of Pathology, Hospital Clínico Universitario, Valencia (Spain) for contributing this case and Drs. Hillary Zalaznick and Ramesh Bhagat, Myriad Genetics, Inc., Utah (USA) for writing the discussion. To contribute a Case of the Week, first make sure that we are currently accepting cases, then follow the guidelines on our main Case of the Week page. (1) We respect your privacy, and do not sell / lend out any email addresses. We use Constant Contact to manage our subscription emails, so it is easy for you to add or delete emails. This can be done by clicking on the Newsletter link in the Header or Footer. Then scroll down to the bottom where it says "Sign up for our Email Newsletters" and enter your email address. (2) Don't forget to shop at Amazon for all your Pathology books or other shopping needs, particularly if you have a book allowance that ends in June. (3) We are looking for high quality authors to keep our textbook up to date. More information is on Instructions for Authors page. A 32 year old woman presented with vaginal bleeding for two weeks. Transvaginal ultrasonography revealed an 18 cm, well circumscribed uterine mass with hemorrhage foci. 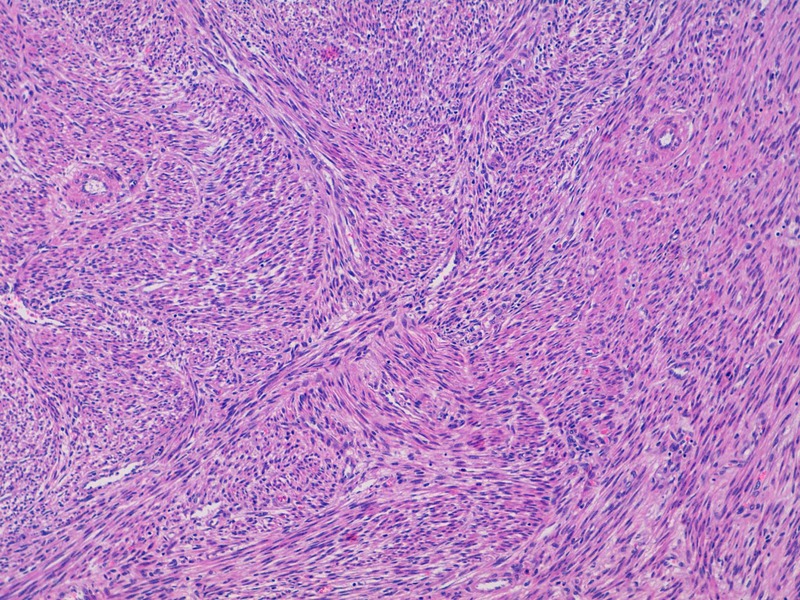 The clinical diagnosis was leiomyoma. A myomectomy was performed. Which of the following would go against a diagnosis of extramedullary hematopoiesis? 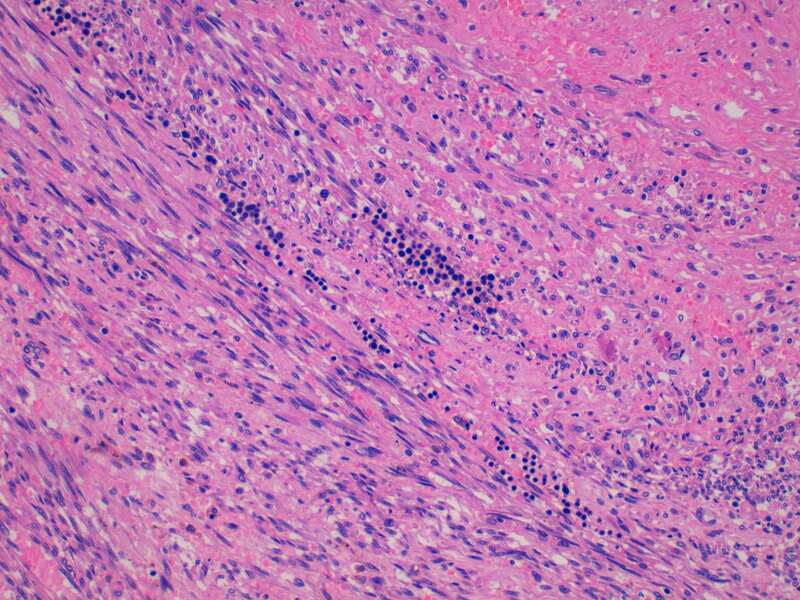 The first microscopic image shows a typical leiomyoma; however, in the remaining images there is an area of hyalinized stroma that has discohesive aggregates of cells with moderate eccentric eosinophilic cytoplasm. The nuclei are round to oval with condensed to moderately dispersed chromatin, and occasional nucleoli. 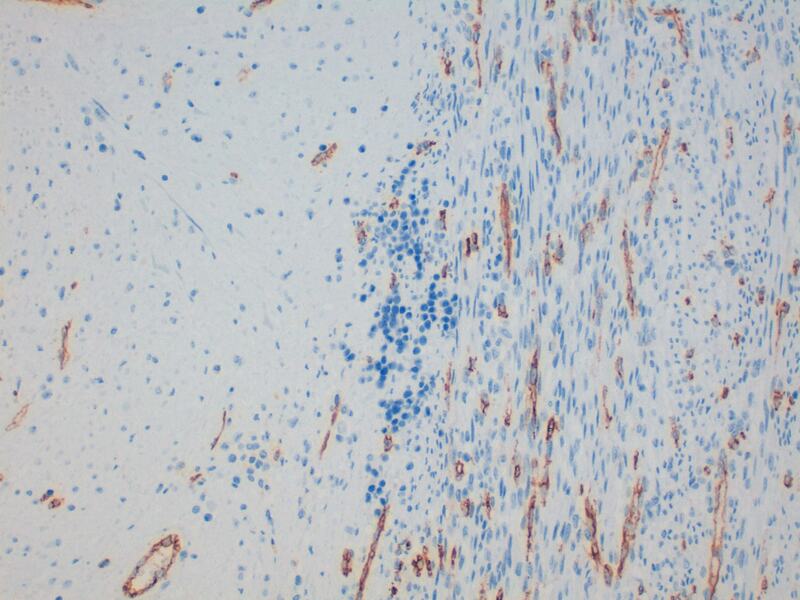 Immunohistochemistry studies confirm that these cells consist of myeloperoxidase positive myeloid precursors (morphologically myelocytes and promyelocytes) without an increase in CD34 positive myeloblasts. In addition to the myeloid precursors, there are smaller cells with a high N:C ratio and very dark nuclei with round nuclear contours (image 2) that are morphologically consistent with erythroid precursors. Immunohistochemistry for glycophorin A could be used to confirm that they are erythroid (Mills: Histology for Pathologists, 4th ed, 2012). The combination of myeloid and erythroid precursors without an increased number of blasts leads to the diagnosis of extramedullary hematopoiesis (EMH). Extramedullary hematopoiesis (EMH) is a proliferation of hematopoietic tissue outside of the bone marrow. It is most commonly seen in the spleen, lymph nodes, and liver, and in association with benign and malignant hematologic diseases (e.g. thalassemia, myelofibrosis). It can also be seen in other organs and in patients without a hematologic abnormality, however (J Turk Ger Gynecol Assoc 2012;13:61). 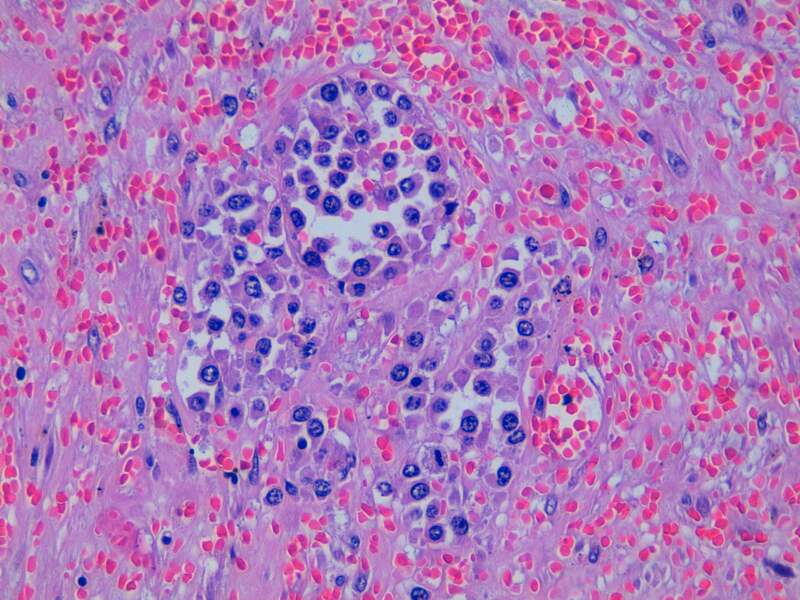 Although not pictured in the images of this case, megakaryocytes are often present in EMH. 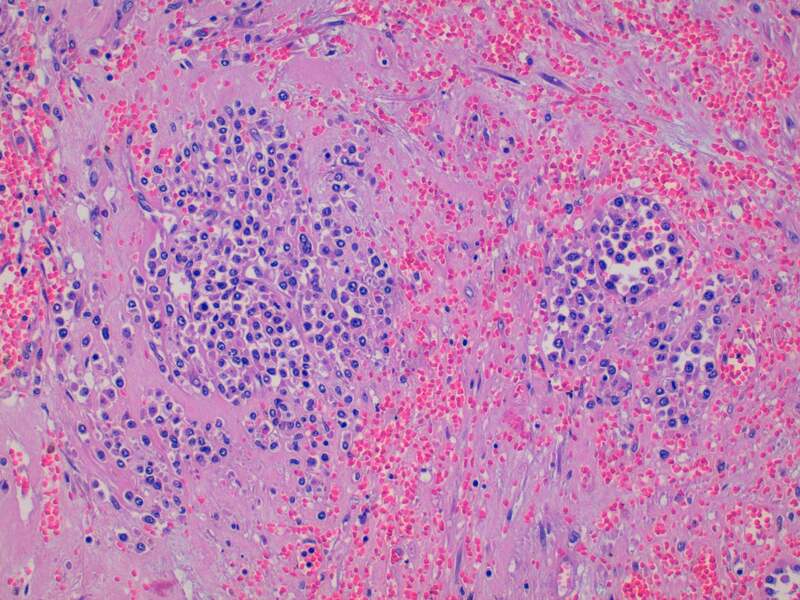 They are typically large cells with dense pink cytoplasm and lobulated nuclei. Some megakaryocytes can have tightly convoluted, hyperchromatic nuclei with minimal cytoplasm, however. Immunohistochemistry for CD31, CD41, CD42, CD61 and factor VIII-related antigen will be positive in megakaryocytes (Mills: Histology for Pathologists, 4th ed, 2012). 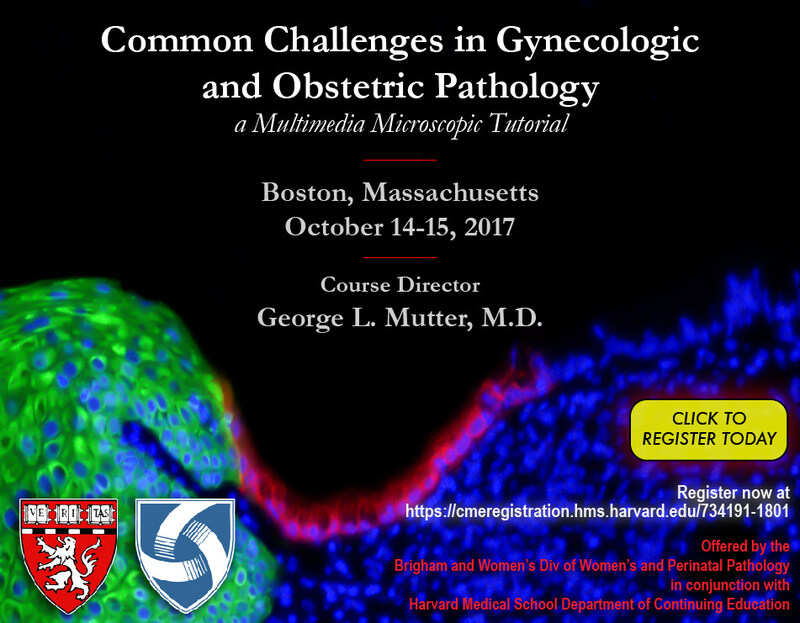 EMH occurring in leiomyomata is very rare, and only a few case reports exist in the literature (J Turk Ger Gynecol Assoc 2012;13:61, Case Rep Pathol 2014;2014:957395, Arch Gynecol Obstet 1990;248:81). The cause of EMH in these reported cases is not certain; thorough work-ups, including bone marrow biopsies, were performed on these patients, and no underlying conditions were found. It is possible the EMH may represent a compensatory reaction to the chronic blood loss/anemia caused by the leiomyomata (J Turk Ger Gynecol Assoc 2012;13:61). 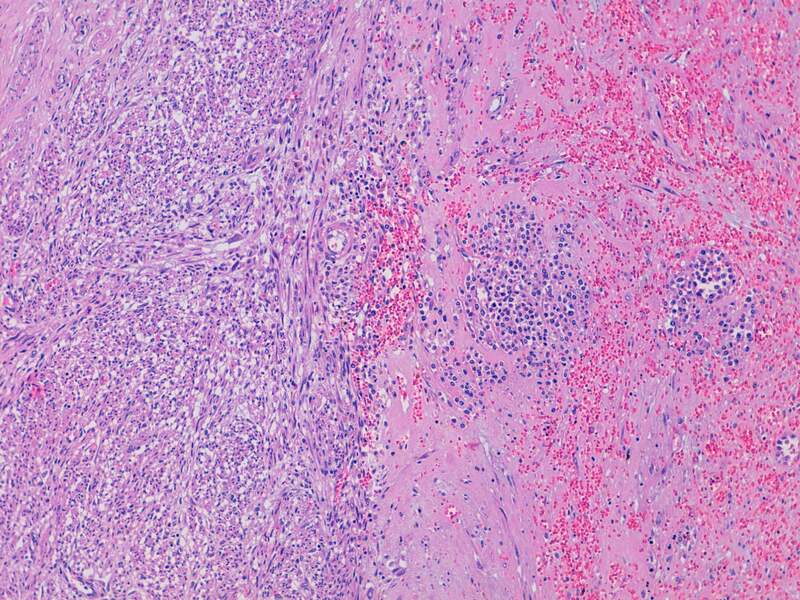 The differential diagnosis for EMH includes malignancies (especially a sarcoma in this case), since the myeloid precursors and megakaryocytes can look atypical out of context. A stain such as CD45/LCA can help identify the cells as hematopoietic. Myeloid sarcoma may also be a concern because of the myeloid precursors. 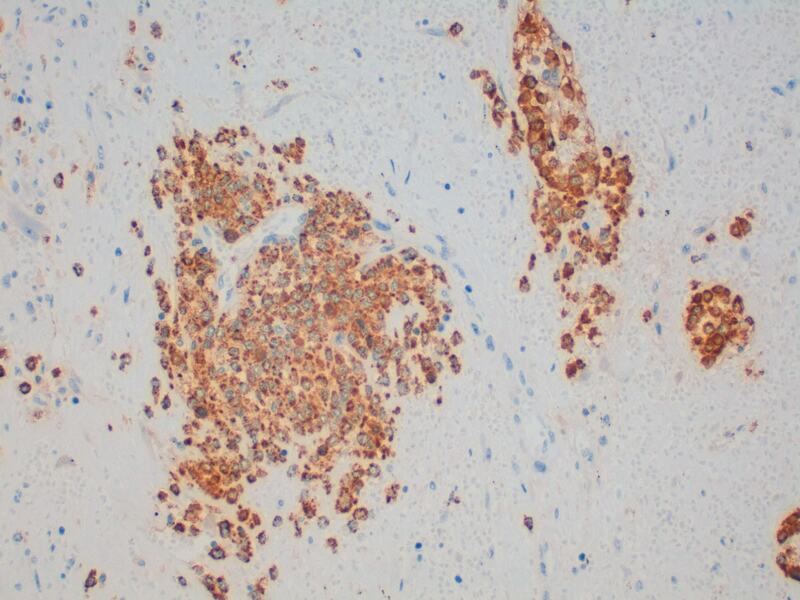 Immunohistochemistry for CD34 is helpful to evaluate for the presence of myeloblasts. It is important to note, however, that only approximately half of cases of myeloid sarcoma express CD34 (Jaffe et al: Hematopathology, 2nd ed, 2017). Rarely, myeloid sarcomas can show trilineage hematopoiesis, predominately erythroid precursors or megakaryoblasts (WHO Classification of Tumours of Haematopoietic and Lymphoid Tissues, 4th ed, 2008); in complicated cases, clinical history and further work-up may be needed to arrive at the correct diagnosis. B. Presence of >20% CD34+ cells. 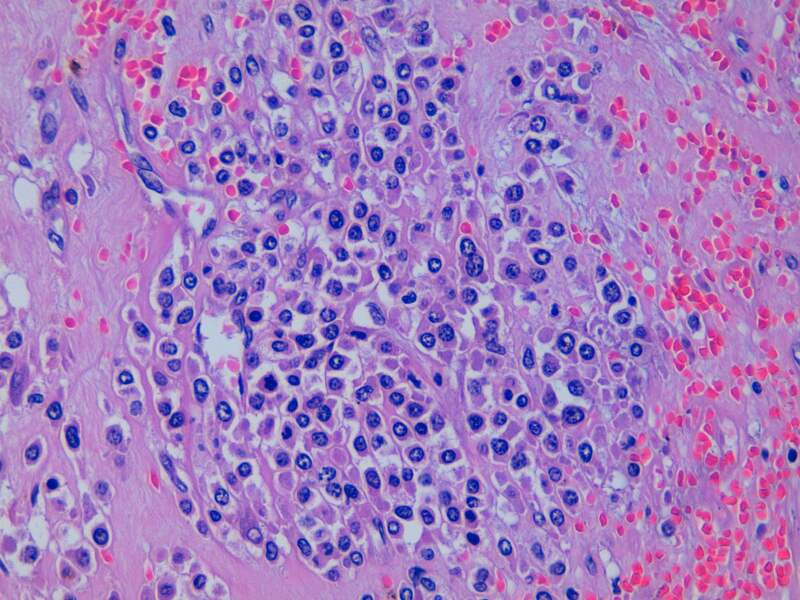 An increased number of myeloblasts would be concerning for myeloid sarcoma.